Bafana Bafana head into this weekend’s clash with Burkina Faso with their World Cup 2018 prospects looking bleak and with an injury and suspension list that can only have added to the woes of head coach Stuart Baxter. September’s World Cup qualifying week has to go down as one of the worst seven days since Bafana Bafana’s re-introduction into international football, a quite remarkable achievement in itself given some of the dross South Africa have produced over the last decade. Home-and-away losses to Cape Verde were followed by the news that Fifa had ordered a replay of Bafana’s victory over Senegal last November, after referee Joseph Lamptey was found guilty of match manipulation in that game at the Peter Mokaba Stadium in Polokwane. Bafana have one point from their opening three qualifiers, and if they are somehow still in the running for Russia, even Stuart Baxter admits he has a job to do to lift the confidence in his camp. It cannot have helped that this week has seen key members of the squad fall out of contention, with captain Thulani Hlatshwayo injured, and Fifa adding an extra game’s ban for Kaizer Chiefs centreback Erick Mathoho. The absence of two kingpins of Bafana’s defence in recent times (yes, Mathoho was woeful in Cape Verde, but he has been excellent elsewhere) means the return of Itumeleng Khune in goal against the Burkinabe looks even more crucial. Amakhosi shot-stopper is carrying a slight injury. Bafana’s defence will need all available experience to keep out a Burkina Faso attack primed with attacking talent like Lyon forward Bertrand Traore. The Stallions are probably still steaming themselves from the news of the replay of the Bafana-Senegal game, which had hit their own chances of qualifying. The Burkinabe Football Federation have appealed Fifa’s decsision with the Court of Arbitration for Sport. The Stallions came close to losing to Bafana in Ouagadougou in the opening Group D qualifying round, needing a stoppage time equaliser, but they also failed to convert two penalties. 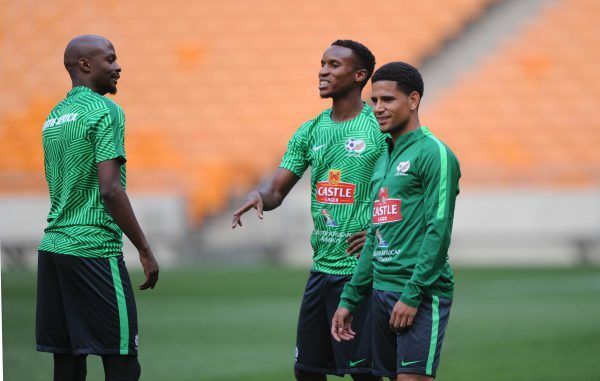 If Bafana can rally themselves to get three points at FNB Stadium on Saturday, it will set them up nicely for the two games against Senegal in November, which they will also have to win to have a chance of qualifying for Russia. But it is hard, right now, to see Bafana even coming close to making it to the World Cup. We get the latest from Baxter in this week’s Phakaaathi, while we also bring you the reaction to the latest Absa Premiership action, which saw Baroka FC pick up the result of the weekend, stunning Kaizer Chiefs in Durban. In our regular One-on-One feature we speak to Banyana Banyana goalkeeper Andile Dlamini, and don’t forget to look out for our Phakaaathi Player-of-the-Month competition for September on Page 8, where you could win R350 in airtime.